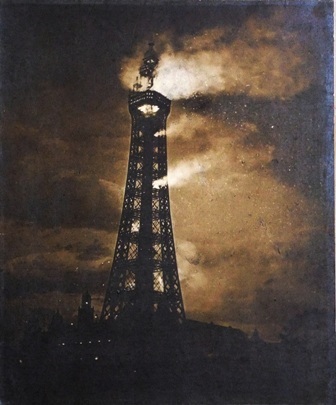 Further details are now to hand of the alarming fire which broke out on the Eiffel Tower, Blackpool, late on Thursday night. It was very soon apparent that nothing could be done to save the arrival platform being burnt out, as a strong westerly wind was blowing, and it was absolutely impossible for the fire brigade, who were promptly in attendance, under Superintendent Sharrock, to bring their appliances to bear on the fire. Indeed, the brigade confined their attention entirely to preventing the spread of the flames to the surrounding property, and in this they were quite successful. Commencing on the west side of the structure, the fire spread rapidly eastward, and in a marvellously short space oftime the arrival platform and two landings immediately above were enveloped in flames. Showers of sparks flew around in all directions, and large pieces of blazing wood dropped away from the burning mass, and sped through the air like rockets. As the flames got better hold of the woodwork, the heat became more and more intense, and long before midnight the iron framework on the east side of the platform was white heat. It was at first feared that some of the men were on the platform, and as escape was obviously impossible from this point anxious inquiries were heard on all hands as to their safety. Fortunately there were no grounds for apprehension on this score, all the workmen who had climbed the Tower on the alarm being raised escaping without injury, with the exception of Mr. Walmsley, whose handswere badly burnt, and who narrowly escaped losing his life. It was some three hours later before the fames entirely died out, and all danger of their extension was at an end. By this time all the wooden erections and framework on the arrival and two higher platforms were totally destroyed, whilstthe two uppermost landings, including the crow's nest, were, comparatively speaking, unaffected. One of the most alarming incidents of the catastrophe was the falling of an immense iron weight counter balancing one of the cars connected with the hydraulic lift. About half-past eleven a terrific crash was heard, practically awakening the whole town, and the residents and visitors poured out of their houses in hundreds and thousands until the streets in the neighbourhood became almost as thronged as though itwere midday. It appears that the fire had burnt through strands of wire rope attached to the car and weight, with the result that the latter, weighing eleven tons, fell from the level of the arrival platforms to the basement of the tower, burying itself in the foundations close to the foot of the north-east leg. At its fall it smashed a considerable portion of the iron framework, and plunged through two concrete floors into one of the private boxes in the circus, and so down to the ground. The effect of the commotion created by this event was terrifying in the extreme, and a general opinion seemed to prevail among the vast crowd surrounding the tower that the whole structure was about to collapse. There was consequently a rapid clearance from the immediate vicinity, and a scene of almost indescribable confusion followed. By midnight the blaze was at its height, and the spectacle as seen for many miles around was one of awful grandeur. Shortly afterwards, however, the blaze showed signs of abatement, and it became evident that all inflammable material was nearly burnt out. The trains arrived yesterday with extraordinary loads of passengers, but there was great disappointment at finding the tower apparently unchanged. Bills have been placed on buildings saying that the structure is perfectly safe, and the entertainments will go on as usual. The structure of the tower itself is practically uninjured, not even the paint having been scorched below the point where the fire originated on the 380 feet landing.